The wait for the next iteration of Intel’s HEDT lineup is over, and it’s been quite a ride. There was speculation that there would be a Coffee Lake-X, a Cascade Lake-X or a new Skylake-X HEDT platform. The latter proved to be the one that actually existed, this ‘Basin Falls Refresh’ is out now, helmed by the new 18-core Intel Core i9-9980XE. However, right now it’s rumored that Intel is planning on releasing a Cascade Lake-X later this year, based on its 14nm process. 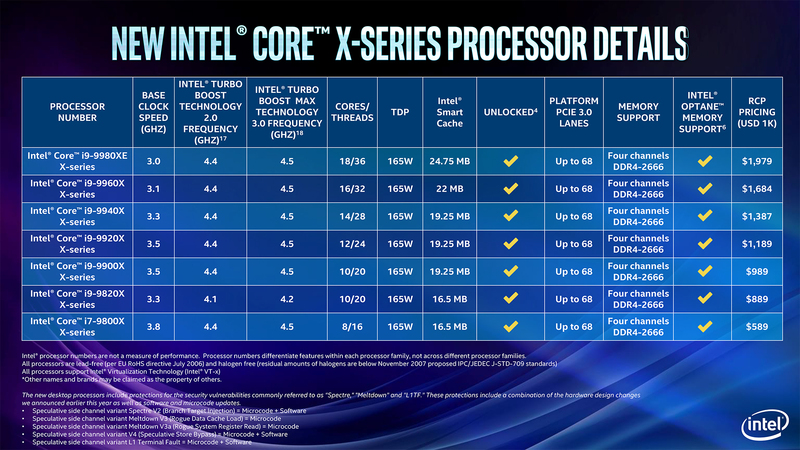 In a lot of ways, the Basin Falls Refresh lineup looks a lot like the initial Skylake-X line that it follows. It features the same amount of cores, but the clock speeds get a boost, along with some enhanced features. These new HEDT processors largely follow in the footsteps of Coffee Lake Refresh, another CPU lineup announced at the same event. The biggest question that crops up with Basin Falls Refresh, though, especially in the midst of the heightened Intel vs AMD battle, is whether or not these new processors provide a better value than the AMD Ryzen Threadripper 2nd Generation processors. To answer that question and more, we decided to gather up everything there is to know about Basin Falls Refresh. From the release date to pricing, and even a bit about the performance of Basin Falls Refresh. So, keep this page bookmarked and we’ll keep this article updated with all the latest Basin Falls Refresh news. The AMD Ryzen Threadripper 2nd Generation platform launched back in August 2018, and ever since then, we’ve been waiting with bated breath for Intel to launch something to compete with it. Now Basin Falls Refresh processors are finally here, and ready to take Threadripper 2nd Generation on. We were initially hoping that Intel would price this new HEDT platform more competitively – especially considering how AMD is gaining popularity right now. Unfortunately, that didn’t seem to happen, with Intel instead pricing its Basin Falls Refresh pretty much exactly how it priced its 7th-generation Skylake-X processors. The prices for all the new X299 chips are as follows, from lowest to highest price. It’s pretty clear that these processors, like their predecessors, are extremely expensive, and are probably not a great value for most everyday desktop users. However, with some of these chips being nearly double the price of their Threadripper equivalents (at least in terms of core counts), it remains to be seen whether or not they will be competitive among content creators and enthusiasts. Only time and benchmarks will tell. It goes without saying that these new Basin Falls Refresh processors bring some major improvements to Intel’s HEDT lineup. The biggest improvement here is the support of up to 68 PCI-E lanes (still only 44 natively on the CPU, though, the chipset supports the remaining 24). These new processors also feature much higher clock speeds, which should help in single threaded applications like gaming. It should be immediately noticeable that as the core count goes up, the base clock speeds go down, this is largely due to increasing power and heat constraints as the core denisty goes up throughout the processor family Still, the boost clocks are pretty stable throughout. Unfortunately, cache on these new Basin Falls Refresh processors is identical to the last generation, with 24.75MB on the Core i9-9980XE, which is the same amount found on the 7980XE. 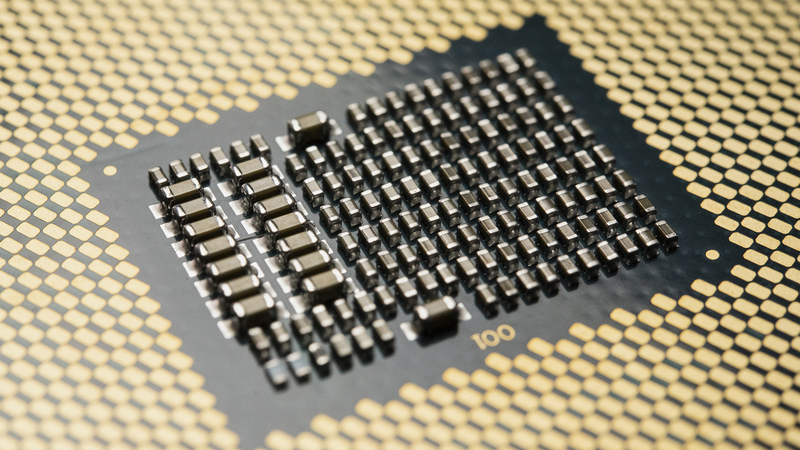 Now, we’ve only tested one of the Basin Falls Refresh chips, the Core i9-9980XE. However, we can use this flagship chip to get a feeling for how the Basin Falls Refresh lineup performs. The improved clock speeds on these Basin Fall Refresh processors lead to improved performance across the board, but in heavily threaded workloads, like Cinebench R15, the Intel Core i9-9980XE still lags behind the Ryzen Threadripper 2990WX. Now, Intel claims that this new lineup is going to lead to up to 108% faster performance over the 2990WX in Adobe Premiere. You might want to take this with a grain of salt, because while we haven’t measured Adobe Premiere performance ourselves, we do have Cinebench numbers for both the Intel Core i9-9980XE and the 2990WX. The Threadripper 2990WX scored 4,913 in Cinebench, whereas the Intel Core i9-9980XE scored 3,640. Now, obviously Cinebench and Adobe Premiere aren’t the same program, but the tasks are comparable enough to make Intel’s claims seem fishy.